Just as this week's album chart (to be issued Thursday) will be full of re-surging music by Whitney Houston, the same will occur on the Billboard Hot 100. In a truly amazing accomplishment, Houston's classic I Will Always Love You jumps back onto the chart at number 7, almost twenty years after its last appearance on the chart. The track sold 195,000 downloads last week along with receiving 18 million audience impressions on radio. As with the album chart, this all occurred in the 36 hours after her passing was made public as chart data closes at midnight Sunday night/Monday morning. Two other Houston songs also jump back on the Hot 100, I Wanna Dance With (Somebody Who Loves Me) at 35 and Greatest Love of All at 41. Madonna also sets a new mark this week, extending her record of the artist with the most top ten singles on the Billboard Hot 100 to 38 as her Give Me All Your Luvin' moves from 13 to 10. She is now up four appearances over the second place Beatles who had 34. Of course, if you add Paul McCartney's top ten hits with those of the Beatles, he would be way out ahead, but that is not how the magazine calculates the record. Well Done Madonna - the Queen of Pop!! 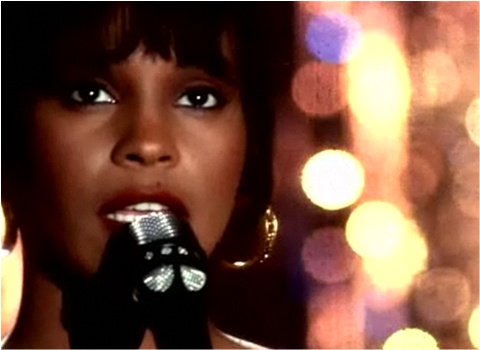 Whitney is and always will be the queen.